At the end of winter a spark of excitement penetrates individuals inclined and interested in gardening. Most of the snow has already melted in the gardens and daylights are considerably longer. Now, as spring is approaching, it is time to fulfill our dreams. 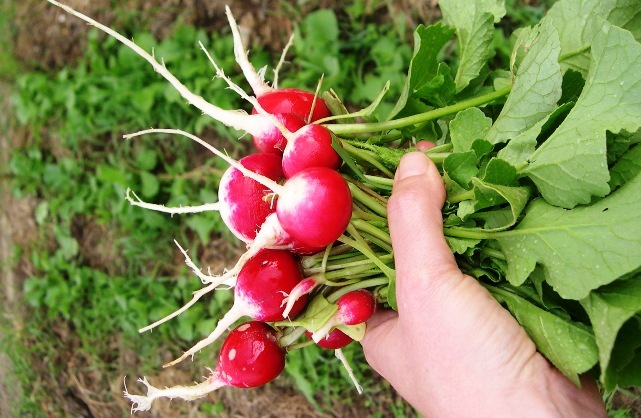 When planning the kitchen garden, the first question to consider is how much of which vegetable we want this year in the garden, and the other is what vegetable seeds we want to sow and what vegetables to plant. Our family-sized kitchen garden plan can be used as a tangible example to make up your own seeding scheme. As you may know: Good seed makes a good crop. You may see our present chart, which has been drawn up at the end of winter, by clicking on the following link. Memories of 2010. In our series of articles published three years ago we were able to see the first results of spring seeding merely in a couple of weeks. We would welcome such yield this year as well. Based on experience from previous years we are going to half the size of our 10×10 meters vegetable garden at the farthest end of our plot. (This can be observed in the column named ‘1.’ of our chart.) Instead of that we designated smaller vegetable parcels. In the first parcel we are going to plant large-sized vegetables (zucchini and other cucurbita, runner bean, potato, eggplant, tomato), and the ones that have to be planted in greater amount (sugar-pea, Swiss chard, spinach) and those that we ‘harvest’ less frequently. Another inspiring photo from 2010. 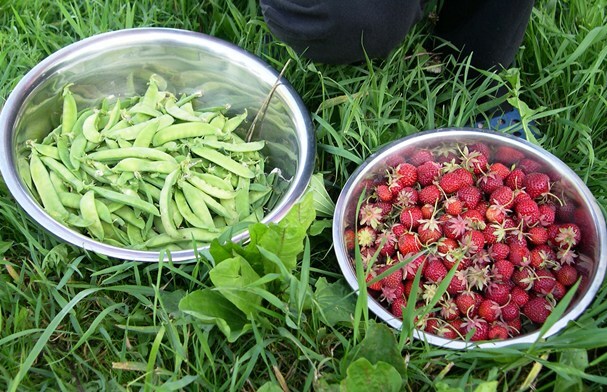 The sugar-pea as well as strawberry gave a huge amount of produce several times. The sugar-pea (left), in contrast to the popular false belief, is not equivalent to the sweet green pea (marrowfat pea). Sugar-pea is a type of pea, whichis prepared and eaten together with its young legume. We have determined the list of vegetables according to our experience of past years. 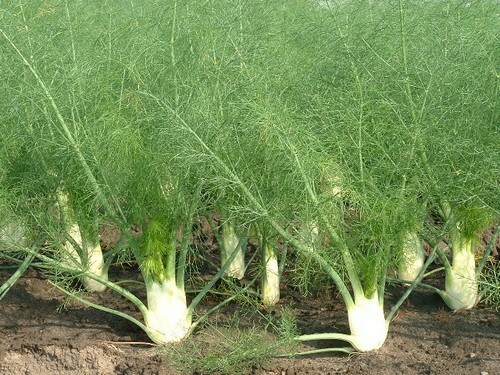 Those species and types of vegetables that due to various reasons (mostly small yield because of hard soil and problems of plant conservation) are proven to be less good, we omitted from the list. Instead we are planning to buy them from the neighbouring organic garden of Krishna Valley. As for those vegetables that proved to yield well or rather we like a lot, we are planting more than in the past years. Such are green bean (it gives good crop), basil (we like it very much, especially after a successful Pesto making last year), sugar pea (pea that is eaten together with its legume and has a wonderful flavour and abundant yield), spinach (it yields well and can be harvested for a long time), field or horse-bean (it gives crop in quite a short time, is drought resistant, and its unique taste brings variety to our kitchen’s leguminous palette), tomato (it yields really well in this climate and it is quite suitable for preserving). To plan an approximate amount of various kinds of vegetables you may take a look at the last column of the chart, where I calculated the average quantity of each vegetable. Taking into account these figures one may easily work out the size of the garden for seeding or the number of to-be planted seedlings. There is another column in the attached chart, which needs some explanation. Actually, it is the second column in the chart, where one can find the letters: A, B and C. The three letters indicate three groups of plants and their definition is as follows. Letter A is for those plants that are the so-called ‘main’ plants, which are going to be in the vegetable garden from May to the time of their harvesting and because of that only green crops that have a short maturation time can be grown before them. These species are: tomato, runner bean, cucumber, cabbage, potato, squash, and zucchini. Letter B indicates those plants that are present in the vegetable garden in the first or second growing period. These are: cauliflower, celery, bean, early cabbage, beetroot, pea, parsnip, onion, black salsify. In their place (before or after their growing period) other species can be grown. Letter C marks those vegetables that have a short growing period. These plants can continuously change each other, or one can plant the various – early, general, or late type of the same species. These species are: early potato, various types of salads, early, mid-early and late carrot, kohlrabi, radish and sweet fennel. This classification comes from G. Franck’s book (Gesunder Garten durch Mischkultur Gemüse, Kräuter, Obst, Blumen) and is based on the length of growing period of various vegetables. 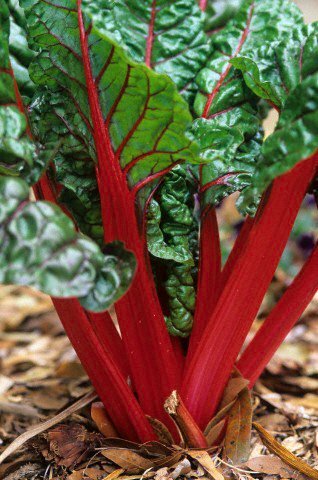 It takes into account the growing time of particular plants and the length of time a certain vegetable takes up place in the garden. Naturally, this classification takes us further, into the planning of vegetable garden from the viewpoint of space and time, which issue we are going to address soon, in one of our next articles.